This has got to be the most creative use I’ve ever seen for nature’s leftovers. This Palmetto Bay home has giant ghosts floating playfully under their oak tree. 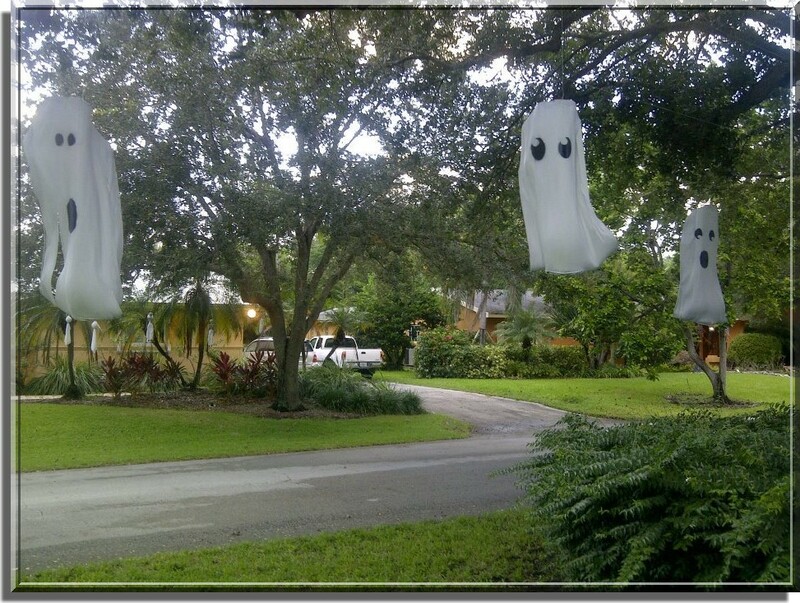 Except these ghosts aren’t made of sheets, plastic bags or crumpled up anything. They are cleverly cut from the Royal Palm fronds that have fallen off the tree. The palm fronds lend themselves naturally to this whimsical project. They have that flowing fabric look. You just trim the top round, paint them white and add black eyes and mouths and you’re good to go! I LOVE these! This entry was posted on Saturday, October 15th, 2011 at 10:59 pm	and is filed under Community News, Palmetto Bay. You can follow any responses to this entry through the RSS 2.0 feed. Both comments and pings are currently closed.